Tuesday, January 29, 2008, 09:58 by Albert M Bezzina, Mosta. 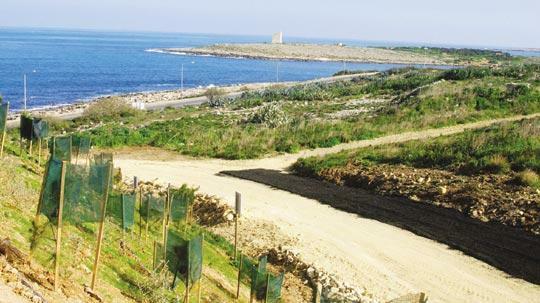 The rehabilitation of (the surface of) Magħtab mountain and its embellishment with trees is indeed good news. I am also pleased to read that the trees have been planted only on the side nearest the coast road, the north to north east facing face. This exercise will hide this eyesore from passing cruise ships and road traffic. We have lived with this scar on the landscape for decades, visible from many vantage points, sometimes spewing an acrid stench onto any area serviced by the prevailing winds. Furthermore, tree planting on the south facing slope should not take place. If trees are planted there, they will create an environmental excuse not to utilise this south facing land with an area of just under 0.25 square kilometres but for the installation of a solar thermal plant with up to 15MW power capacity. Solar thermal plants can directly generate electrical power, but they are also ideal means of storing energy as heat which can then be utilised during night time hours. They can be used in conjunction with both extracted landfill methane gas and with compressed air produced and stored from excess power generated from off shore wind turbines. 0.25 square kilometres is not a large area. It would hardly be considered for a solar thermal installation in large countries. We are not a large country, we have limited space, and if we could live with a rubbish heap for decades we can very well live with a solar thermal plant in the coming decades and start fulfilling our obligation to find ways to generate 10 per cent of our energy needs from renewable sources of energy by 2020. The clock is ticking. Every month of procrastination will make the set target more difficult to achieve by 0.7%. A cursory look at the Maltese landscape can easily provide another 1.5 square kilometres of disturbed land for similar solar thermal plants (solar tower or solar collecting troughs) with an additional total installed power capacity of around 90 MW. These plants can shave off a tenth to a fifth of Malta's energy demands during the sunnier months. The problem with actuating such projects will always be reluctance to let cash out of our country's clutches.